Will Better Soybean Prices Boost Cresud? Is better pricing for soybeans pushing Cresud's stock price up? What's the outlook for the company? How's this scenario affecting Bunge as well? Soybeans are showing clear signs of strength again. Last week, after recovering more than 4% in two days, the crop price reached $562.9 a metric ton in the Chicago Board of Trade, its maximum in 10 months. Increasing demand for livestock feed in China, the world's biggest soybean consumer, is behind the price movement. China is experiencing strong price increases in eggs and hogs, which grew 26% and 20%, respectively, according to data from Shanghai JC Intelligence. Production of pork and eggs use the crop as input, pushing soybean meal prices in the country to grow 13% in the past nine weeks. How is this scenario affecting Cresud? For companies like Cresud (NASDAQ:CRESY), one of the leading agricultural companies in Latin America, soybean price increases are clearly beneficial. The company's soybean sales grew 29% during the nine months ending March 2014, reaching 108,308 tons. But sales are not over, since the harvesting season is currently taking place in Latin America. In the beginning of April, 42% of Cresud's soybean has been harvested in Argentina, 17% in Paraguay, and pretty much complete in Bolivia and Brazil. So, there's quite some product still left to sell and profit from this good pricing scenario. However, measured in dollars, this ADR could show losses looking forward. During the past year, the strong depreciation of the Argentine peso had a negative impact on Cresud's net financial results as the company is located in the country. Just think that from July 2013 to March 2014, the Argentine currency depreciated 49%. Impressive. Considering that a significant portion of the company's debt is denominated in dollars, the depreciation had an adverse impact on Cresud's financial results. During this period, the company tripled its loss to 1,931.4 million pesos, about $240 million at current exchange rate. So, is the market punishing the company? Well, certainly not recently. 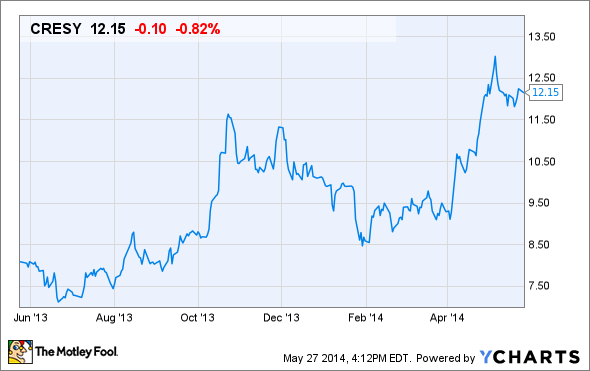 The stock price went up more than 30% since the beginning of April, to $12 a share. Two big factors could be influencing this growth. First, good forecasts for commodity prices looking ahead, and second, a better outlook for Argentina's currency volatility. The exchange rate is now stable, around 8 pesos per dollar, and depreciation expectations remain calm. After all, during this period is when most of the country's 55.5 million tons of soybean harvest is exported, primarily to China. The influx of payments in hard currency calms down the country's foreign exchange market. One of Cresud's peers, Bunge (NYSE:BG) started the year with a slower performance than expected. The temporarily depressed crushing environment in China and losses in its grain trading and distribution business (which anticipated lower grain prices) affected its results. Total net sales in fact dropped almost 9% year over year to $13.46 billion. Nonetheless, the company's outlook for the year remains positive. Harvest execution in Brazil is in its final stage for the season and Bunge's strong position in logistics in the country should help bring profits coming ahead. Plus, this spring we should see large crops being planted in the Northern hemisphere, allowing strong asset utilization and exports later in the year. As a result, Bunge targets full-year, combined returns for its agribusiness and food and ingredients at 1.5 points above cost of capital. The company expects export demand for soybean meal, crush margins, and utilization in South America to remain strong through September, when export demand starts to shift back to North America. Although most supply comes from the Americas, the recent events that are making soybean prices move originated in China. Last month, many soybean importers were at risk of defaulting after bird flu alerts pushed pork prices down. Consequently, Chinese crushers sold their soybean meal stocks to foreign clients, and now they are restocking product. This explains why China imported 6.5 million tons last month, up 63% year over year, and exported 300% more soybean meal as well. But the interesting thing we need to understand is that, despite these stock disruptions, demand for soybean remains solid. Otherwise, the extra stocks would have found no demand, with negative consequences on prices. Regarding Cresud, the price scenario looks good, and sales figures for the upcoming quarters should improve. Although Argentina's currency instability did not help the company, this year Cresud should expect less volatility. Why? The company is diversified geographically and production-wise. More than half of the company's developed farmland is located in Brazil, and soybean production is about 56% of crop production. Hence, it's not fully exposed to Argentina. Plus, the country's currency seems to have stabilized recently. Bunge has a positive outlook as well, and the company has practically no exposure to Argentina. The company's operations are based mostly in Brazil, where the soybean harvest is complete, and the U.S., where planting is beginning. If demand and prices remain strong, we should see a turnaround in the following quarters.